A U.N.-run observation post near the border was struck during fighting between Israel and Hezbollah militants on Friday, while Israel resumed airstrikes on Lebanon and warned people in the south to flee as it prepared for a likely ground invasion to set up a deep buffer zone. CBS News correspondent Lee Cowan reports that Hezbollah guerrillas fired two rounds of rockets at the Israeli city of Haifa Friday, wounding three people and blowing out the windows of an office building. The first round of five rockets struck Israel's third-largest city at 1:10 p.m., heavily damaging a bookshop on the ground floor of the small office building in the center of town. A second volley struck the city just after 2:45 p.m. The Israeli army also said Hezbollah rockets hit the U.N. post near Zarit, just inside Israel, but a U.N. officer said it was an artillery shell fired by the Israeli Defense Force. The facility was severely damaged, but nobody was injured as the Ghanian troops manning the post were inside bomb shelters at the time of the strike, the U.N. official said. Israeli warplanes also pounded Lebanon's main road link to Syria with missiles and set passenger buses on fire, police said, adding that part of Lebanon's longest bridge collapsed. Two Apache attack helicopters collided in an accident northern Israel near the Lebanon border early Friday, killing one air force officer and injuring three others, two seriously, Israeli officials said. Al-Jazeera reported that four soldiers were killed in the crash, but did not give a source. French Foreign Minister Philippe Douste-Blazy, meanwhile, said his country was dispatching urgent aid to Lebanon by air and sea and he called for safe passage. His comments came a day after U.N. Secretary-General Kofi Annan warned of a humanitarian crisis in Lebanon and called for an immediate cease-fire, CBS News senior White House correspondent Bill Plante reports, even as he admitted "serious obstacles" stand in the way of even easing the violence. Israel appears to have decided that a large-scale incursion across the border was the only way to push Hezbollah back after 10 days of the heaviest bombardment of Lebanon in 24 years failed to do so. But mounting civilian casualties and the displacement of hundreds of thousands of Lebanese could limit the amount of time Israel has to achieve its goals, as international tolerance for the bloodshed and destruction runs out. The Israeli army said Friday that it has called up more reserve troops to augment its current forces in northern Israel, widening speculation that a major ground offensive against Lebanon has moved beyond the planning stage. The army said the call-up was issued in the morning and that several hundred, if not thousands, of soldiers were being told gather at specific meeting points for deployment northward. A prominent Syrian Islamic cleric warned Friday that the United Nations was on a collision course with Islam and assailed Arab leaders for their response to the crisis in Lebanon. In a fiery sermon at this city's Abu Al Nour mosque, Sheik Salah Keftaro said both the U.N. Security Council and the international community were attempting to "undermine our doctrine, occupy our lands and kill our people with the most sophisticated U.S. weapons." Australia on Friday pledged $1.9 million in humanitarian aid to victims of the bloody conflict between Israel and Lebanon. "The Australian assistance will enable the Lebanon Red Cross Society to meet the immediate needs of thousands of affected civilians with food and water, medical supplies, shelter and hygiene kits," Ausaid said in a statement. In Gaza, Israeli forces pulled out of a refugee camp, residents said, and the military confirmed that a two-day sweep was completed. In two days of battles in the Mughazi camp, Israeli forces killed at least 14 people, most of them militants. Residents said they left behind considerable destruction, tearing up water pipes and electricity wires. For the first time since 1984, U.S. Marines hit the beaches in Beirut Thursday to help evacuate thousands of fleeing Americans. The U.S. Embassy hoped to move twice as many people Thursday as it did Wednesday and then double again the number Friday, reports CBS News correspondent Elizabeth Palmer. 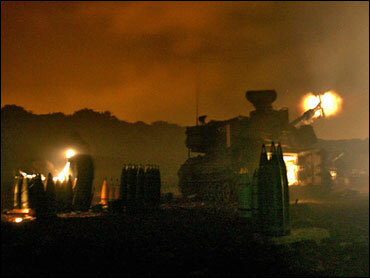 Top Israeli officials met Thursday night to decide how big a force to send in, according to senior military officials. They said Israel won't stop its offensive until Hezbollah is forced behind the Litani River, 20 miles north of the border, creating a new buffer zone in a region that saw 18 years of Israeli presence since 1982. Israel has stepped up its small-scale forays over the border in recent days, seeking Hezbollah positions, rocket stores and bunkers. Each time it has faced tough resistance from the guerrillas. Airstrikes left three passenger buses were in flames in the Bekaa Valley near the Syrian border, on the road linking Beirut and Damascus, but police said nobody was hurt or injured. The buses had just dropped off foreign passengers in Syria. Israeli warplanes also fired four missiles that caused the collapse of part of a 1.6 mile-long bridge linking two steep mountain peaks, part of the Beirut-Damascus highway in central Lebanon. Also Friday, heavy black smoke billowed as Israeli warplanes renewed attacks on the ancient city of Baalbek, a major Hezbollah stronghold. Warplanes also attacked Hezbollah strongholds in south Beirut and elsewhere overnight. The Arab satellite TV channel Al-Jazeera said one person had been killed in south Beirut and another wounded, but the report could not be immediately confirmed by security officials. A U.N. official said an artillery shell fired by the Israeli Defense Force "impacted a direct hit on the U.N. position overlooking Zarit." The U.N. mission, which has nearly 2,000 military personnel and over 300 civilians, is to patrol the border line, known as the Blue Line, drawn by the U.N. after Israel withdrew its troops from south Lebanon in 2000, ending an 18-year occupation. At least 335 people have been killed in Lebanon in the Israeli campaign, Health Minister Mohammed Jawad Khalife said at midday a rise of 29 over the past 24 hours.Thirty-four Israelis also have been killed, including the air force officer killed Friday and 18 soldiers. Cowan reports that hundreds of Lebanese hospitals are overwhelmed and running short on supplies. Those who can't be saved are left in frozen trucks waiting for family members, most of whom have already fled. Hezbollah said two of its fighters had been killed in the latest fighting with Israeli troops, bringing to five the number of guerrillas killed since Israel launched a massive military campaign against Lebanon after the militant Shiite Muslim group captured two of its soldiers on July 12. Annan denounced Israel for "excessive use of force" and Hezbollah for holding "an entire nation hostage" with its rocket attacks and snatching of two Israeli soldiers last week. The United States, which has resisted calls for it to press its ally Israel to halt the fighting, was sending Secretary of State Condoleezza Rice to the region, White House spokesman Tony Snow told CBS News' The Early Show. Israeli officials said she would arrive in Israel Tuesday or Wednesday after stopping over in Arab nations. They spoke on condition of anonymity because the schedule was not yet confirmed. The mission would be the first U.S. diplomatic effort on the ground since the Israeli onslaught against Lebanon began nine days ago. "In the long run, you want to make sure you get a situation where the Israelis are in a position to make peace in Palestine and everybody in the neighborhood is in a position to get along better," Snow told CBS News. Ships lined up at Beirut's port as a massive evacuation effort to pull out Americans and other foreigners desperate to flee the fighting picked up speed. U.S. officials said more than 8,000 of the roughly 25,000 Americans who live or work in Lebanon will be evacuated by the weekend. Hezbollah leader Sheik Hassan Nasrallah shrugged off concerns of a stepped-up Israeli onslaught, vowing never to release two Israeli soldiers captured by his guerrillas even "if the whole universe comes (against us)." He said they would be freed only as part of a prisoner exchange brokered through indirect negotiations. He spoke in an interview with the Al-Jazeera news network taped Thursday to show he had survived a heavy airstrike in south Beirut that Israel said targeted a Hezbollah underground leadership bunker. The guerrillas said the strike only hit a mosque under construction and no one was hurt. In preparation for a more powerful punch deeper into Lebanon, an Israeli military radio station that broadcasts into the south issued what it called "a strict warning" that Israeli forces would "act immediately" to halt Hezbollah rocket fire. "It will act in word and deed inside the villages of the south against these aggressive terrorist acts. Therefore all residents of south Lebanon south of the Litani must leave their areas immediately for their own safety," the message in Arabic on the Al-Mashriq station said. More than 300,000 people are believed to live south of the Litani, which twice has been the border line for Israeli buffer zones. In 1978, Israel invaded up to the Litani to drive back Palestinian guerrillas, withdrawing from most of the south months later. Israel invaded Lebanon again in a much bigger operation in June 1982 when its forces seized parts of Beirut. It eventually carved out a buffer zone that stopped at the Litani. That zone was reduced gradually but the Israeli presence lasted for 18 years until 2000, when it withdrew its troops completely from the country.